This article applies to any version of the plugin, release 2.0.7 or higher. Many themes include their own author box on the post layout, most commonly underneath your post’s contents. While handy in some cases, they cannot be customized and lack all the features that Molongui Author Box has. So, if you are using Molongui Authorship plugin, you will surely want to disable such basic author box, so just the Molongui one is displayed. Using your theme options, so the author box is not displayed at all. Making use of the advanced setting that Molongui Authorship has that allows you to hide any element on your site just by specifying its Id or CSS class. 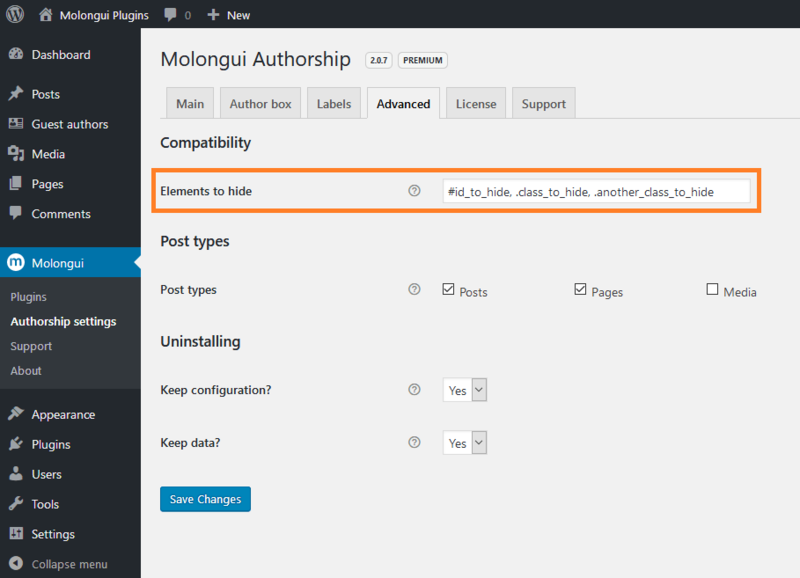 If your theme has no option to disable its author box, you can use Molongui Authorship “Elements to hide” setting. Just inspect your website’s source code to identify the ID or CSS class the author box has. Once identified, go to: Molongui > Authorship settings > Advanced. There you will find the mentioned setting. It is an text input field where you can write in as many comma-separated IDs or CSS classes as you need (remember to prefix IDs with a hashtag, like #, and CSS classes with a dot, like .). All the elements with those IDs or classes will be hidden (not removed) from your website’s frontend. 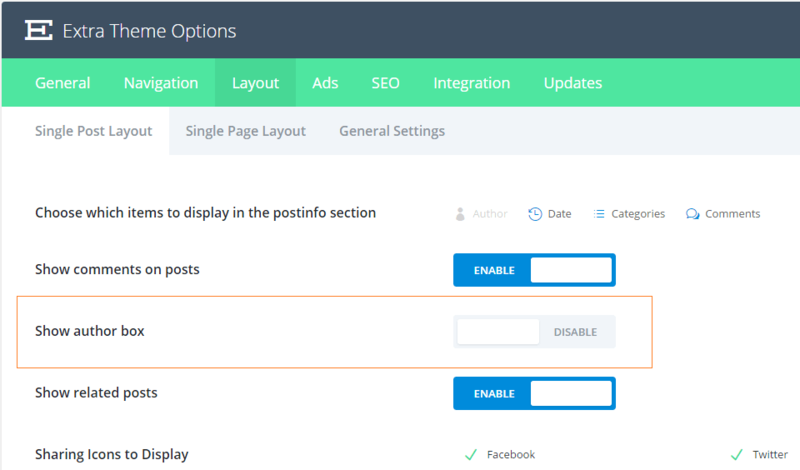 From your WordPress dashboard, go to: Avada> Theme Options > Blog > Blog Single Post. There, you will find an “Author Info Box” toggle. Just turn it off and Save Changes. 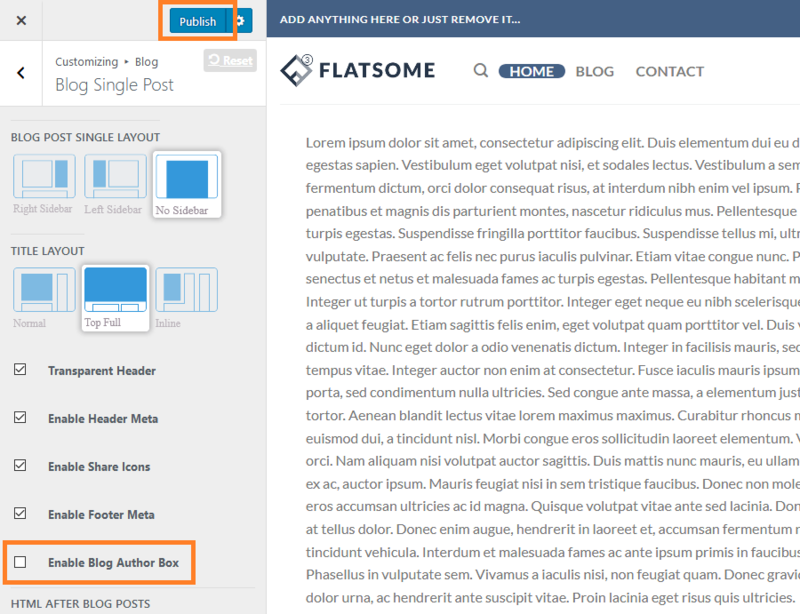 From your WordPress dashboard, go to: Flatsome > Theme Options > Blog > Blog Single Post. There you’ll find a “Enable Blog Author Box” checkbox. Just uncheck it and Publish. 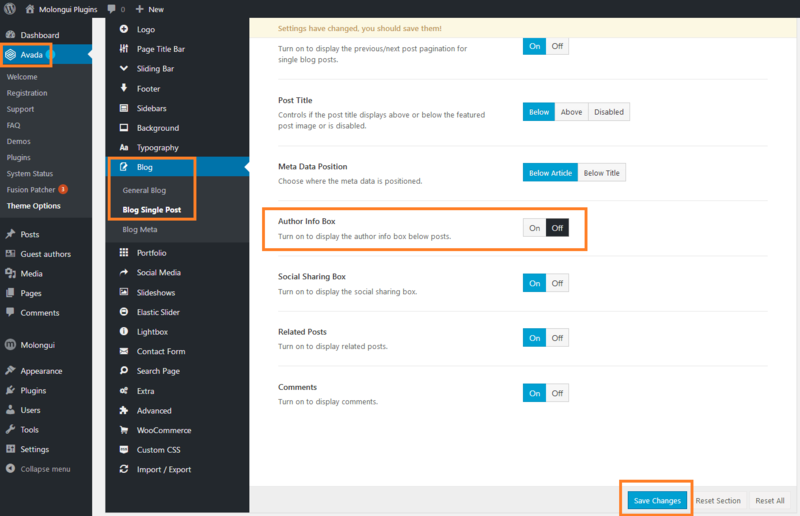 From your WordPress dashboard, go to: Extra > Theme Options > Layout > Single Post Layout. There you’ll find a “Show Author Box” option. Just toggle it to “Disable”. From your WordPress dashboard, go to: Users > Your Profile > Author Box. There, you will find a “Enable Author Box on this User’s Posts?” checkbox. Just uncheck it and save.